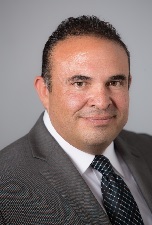 Luis M. Ortiz has an AV® Preeminent Rating from Martindale-Hubble and has more than twenty-five years experience counseling and representing clients in intellectual property matters including: litigation, licensing, patent and trademark prosecution, patent/trademark portfolio development strategies. Luis is licensed to practice law before New Mexico State Courts, Texas State Courts, Federal District Courts for New Mexico and Eastern District of Texas, the Federal Court of Claims, the Court of Appeals for the Federal Circuit, and as a “registered patent attorney” before the U.S. Patent and Trademark Office. Luis is also a Certified Licensing Professional (CLP®). Luis retired from the U.S. Air Force Reserve as a Lieutenant Colonel, Judge Advocate General’s Corps, after thirty years of service. This website is not intended for nor is it to be used as a substitute for legal advice. You should not act, or refrain from acting, based on any information available via this website. We expressly disclaim all liability in respect of actions taken or not taken based on any contents of this website. This website is not a solicitation of nor an offer to represent you. You should not consider the content of this website to be an invitation for an attorney-client relationship, should not rely on the information provided herein as legal advice for any purpose, and should always seek the legal advice of competent counsel in the relevant jurisdiction. We will not have an attorney-client relationship with you until and unless you and we conclude a formal agreement of engagement.